This pretty, aromatic syrup is delicious poured over roasted peaches and served with Greek yogurt or crème fraîche. It is equally good when used to flavor meringues, cakes, and cookies. For information regarding harvesting, preserving and cooking with fresh lavender, see the notes below. Put the lavender flowers, sugar, and lemon zest strips into a saucepan with 1¼ cups water. Place over medium heat and stir. Once the sugar has dissolved, after 3 to 4 minutes, stop stirring and remove from the heat. Leave to infuse for at least 30 minutes, stirring occasionally. Return the pan to medium heat and bring to a boil without stirring. Turn the heat to high and let the syrup bubble for 5 to 7 minutes until thickened. Remove from the heat. When the syrup is cool enough to handle, strain slowly and carefully through a fine sieve, lined with dampened muslin, into a warm sterilized bottle. Leave until completely cold before sealing. Store in a cool place and use within 4 to 6 weeks. Pick flower heads or stems of lavender (if drying) when they first open. The leaves can be picked at any time and used sparingly for cooking. 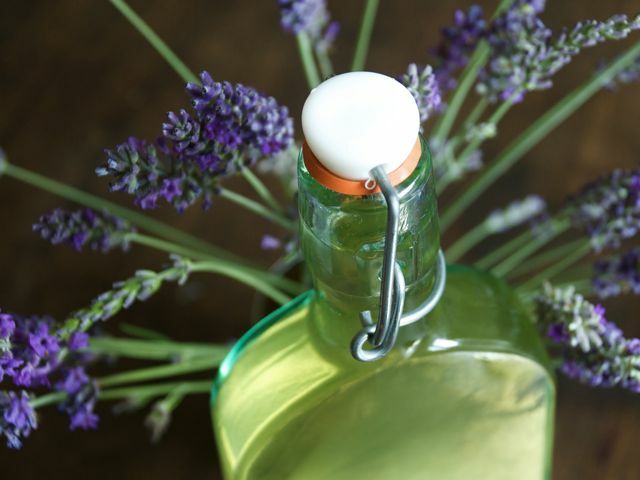 Store fresh lavender in a glass of water, in or out of the fridge, for up to 5 days. Use the leaves like rosemary to accompany roast lamb, or to add a wonderful aroma to baked goods. Dry picked flower heads on muslin for 3 weeks and store in sealed glass jars for up to 6 months, or tie whole bunches with string and hang up to dry. Freeze chopped flowers with water in ice-cube trays, and use in drinks and to flavor syrups, jellies, and baked goods.